First a kind thank you to Glenn for allowing me to spotlight him on my blog! I love meeting new authors and even though Glenn may write Crime Thrillers, he's a total sweetheart! Glenn's life experience is a 360 degree turn around and inspiring. It's a pleasure to say I know him! Here's a little pick into the mind of Author Glenn Langohr! 1.Where do you call home? I live in Orange County, California with my wife Sanette and her son Jon. 3. What's your Genre? Crime thriller. 4. Plans for a next book? Is this part of a Series? My next book is going to be free on all venues to give back. I want to open the eyes of the public that the drug war has made the U.S. a prison nation. We have to be more compassionate to people who suffer from Alcoholism and drug addiction. -I agree! 5. Are you a self published author (Indie) ? 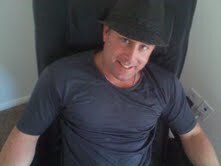 I am an indie author and love it! 6. Who's your favorite author? My favorite author is James Clavelle. 7. Your favorite book? My favorite book is the Bible. There is the perfect amount of imperfect characters and good over evil. 8. What book are you currently reading? The Reluctant Tuscan by Phillip Doran. 9. A book you would recommend? Any book from fellow indie author JT Kalnay. 10. How do you pick your books? The title of the book and the book cover is my first interest, then the description and reviews. I also pick books by other people’s reactions to them. 11. Advice for other authors? Read everything that does well in the genre you write. Wake up at 4 am to start writing, then write every chance you get until the creativity is flowing non-stop. Make the characters believable until the emotion is flowing out of them and into the readers. -great advice! 12. Do you write under a pen name? No. 13. Where do you write? I write in my bedroom by myself. I have to block everything else out to concentrate. 14. What do you wear when you write? Pajamas. - the best way! 15. Do you have a pet (s)? I have a German Shepherd named Primo. 16. Favorite food? I love carne asada tacos with guacamole, sour crème, onions and cilantro. I also love the authentic Italian food my mom makes. 17. If you were deserted on an island, who are 3 famous people you would want with you? On a deserted island I’d be most comfortable with people who are shorter than me who are funny so Danny Devito, Joe Pesci and Robert De Niro. 18. Of your characters, which one would you say is most like you and why? 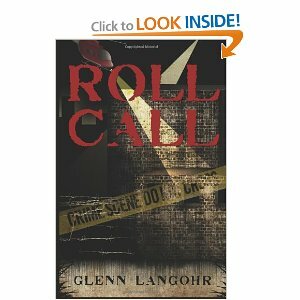 Roll Call is my first novel and is based on a lot of my life experiences. I took my research into the drug war a little too far and found my redemption through writing. 19. What made you want to be a writer? 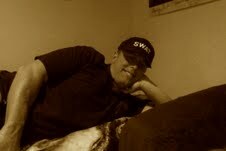 As mentioned, I got heavily involved in drugs as a runaway kid. In prison on drug charges I wanted to turn everything into a blessing through writing. 22. What is the one thing you never go without? I’m very affectionate. I need a lot of hugs and kisses on the cheeks.- awww! 23. Your biggest influence? My church at Calvary. 24. Favorite TV show? Criminal Minds. 25. A great blog you would like to recommend for others to discover? I have found the best blogs on book blogs and would have to say that so far it’s justjudyjumblesblog. P.S. June 7th is the start off of my next Blog hop Giveaway- Debut Author Blog hop! Click the Giveaway tab at top and enter to win 4 ebooks from new authors! Great interview. Will have to look for Glenn's books! Thanks for the drop by Katie! I love his cover art, it reminds me of the Joker:0) Thanks for dropping by Liesel! Great interview and nice blog A.D., I am definitely going to follow you! 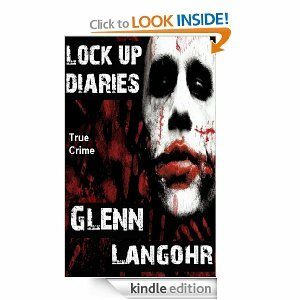 I am reading Lock Up Diaries right now but otherwise have read all of Glenn's books and highly recommend them. I didn't think I would enjoy the true crime so I started with Underdog because it was a shorter read. It changed my thinking. Glenn's writing brings you into the book, if you read like me and "see" as you read. The inmates become real people. Sorry for going on but it encouraged me in such a way that I am writing to some relatives of a friend and received my first letter yesterday. What a great feeling to let someone know they are not forgotten. Thanks Glenn for sharing your life experiences with us readers!